Innovative laptop case unfolds instantly into a multi-angle ergonomic laptop stand. Zipper closure secures your keyboard and mouse inside the sleeve. Checkpoint friendly. An innovative "always on" protective laptop sleeve that transforms instantly into an adjustable angle ergonomic laptop stand. Checkpoint friendly. Luxury leather-upholstered desktop arm pads wrap around you to provide superior upper limb support for keyboard and mouse activities. A multipurpose computer writing slope, laptop stand, metal document holder, reading stand and book holder with adjustable angle settings to 45° degrees helps reduce neck and back ache. For single-surface desks. 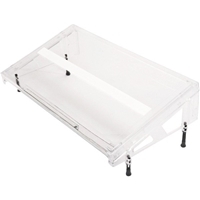 This transparent, sloping, writing surface fits over the top of your keyboard to allow easy access to your keyboard while working with papers and books. Reconfigurable to fit flat desktops, keyboard trays, and bi-level desks. A transparent, sloping, writing surface that fits over the top of your keyboard, allowing easy access to your keyboard while working with papers and books. For keyboard trays and bi-level desks.